If you are in South Florida near fresh water, eventually you will see one of these beasts. They don't belong. Green Iguanas are an invasive species here. They're a destructive pest that is disrupting the environment for those creatures that actually do belong here. It doesn't mean that they can't be entertaining. It probably means that the winter didn't get cold enough to kill the things off. I described that process as the Iguana Rain before - it gets below 45F and they're stunned by the cold. Their metabolism slows down and their muscles let go. Then they will fall from the trees. Mind you, it's not a gentle fall, but one that most survive. The people in Trinidad and Tobago swear by Curried Iguana Tail, and they are welcome to the creatures. All these thoughts went through my head. I was sitting in the window seat indoors at the Indian restaurant. There is this little river or canal that is behind the place on Griffin road. The small development on the other side of the little river had people to watch. Kevin went off to answer an emergency call, and I continued dining on savory-not-spicy Indian food made for a British and American palate. Not A Wall Of Heat Indian food is a treat. I speared a little dough ball that tasted richly of honey and butter. Looking out the window I got the picture taken of this green beast going about its life. Adolescent four foot long lizard eating bugs that were in the sun. Harmless where it was. I was alone at the moment. I spotted Kevin conducting his business from the parking lot. He was chatting with someone who had left his phone at home. The person who was to rescue the phone left it on the roof of the car and drove off. Too much drama for my tastes, I keep my toys intact. While the feeding went on both inside and outside, I spotted another Iguana across the river on a tree branch. We do live around a lot more wildlife here in the middle of the South Florida Sprawl than you might expect. Toads, Iguanas, Boa Constrictors, and native species are all over the place. A Road Pizza could be any of those and more. Looking at the tree I noticed a stray parrot in the sun, squawking at the lizard. It is better in the trees, but it too didn't belong. Yet another great great grandchild of a released former pet. They get out into the wild here and once the genie is out of the bottle, it is difficult to put it back, if not impossible. I hear the little old British Lady at the next table go on a bit longer than would be polite about not having Her Pink Packet to sweeten the rather excellent Iced Tea that I was drinking some of. I'm sure she had her own stash in her rather large purse, but people do have their tastes, even if it was questionable. Spearing another large bite of a fried vegetable ball, I hear the other British Woman tell the first that she was being "a bit churlish" and that she should calm down since the Iguana that she was now obsessing over was on the other side of the glass. Greeted by my faithful sidekick, Kevin, who asks how the meal is? Wonderful of course. But I did miss my Mango Lassi. 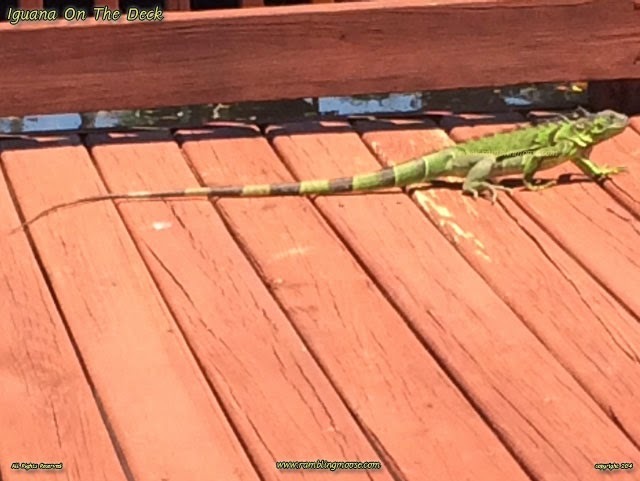 Did you see the iguanas? Yes, so did the woman behind you. Said with an Eye Roll. It didn't get cold enough to get rid of them this year. Are you getting dessert? The Donut balls are excellent and the Mango Pudding I would love to try to make at home! He was full, and I was over full. That meal was responsible for a few extra groans that it would take a day and a half to get rid of. One of the children from that table way over there had gotten out and wandered to the back deck. Smart Iguana decided it had warmed enough and dove for the water. We weren't going to solve all of the invasive wildlife problems today, but we did get a rather excellent meal.